<div align="right"> DO NOT USE MY ART WITHOUT PERMISSION! Es la primera vez que doy una critica y realmente nunca me habia animado pero cada ke veo uno de tus trabajos pienso ke es algo ke no puedo dejar pasar, comentar lo buenas y dedicadas que son cada una de tus obras. 164 out of 183 deviants thought this was fair. I think the gazes of the characters greatly attribute to the emotionality of this picture, rendering Sasori being a bit ashamed by him escaping Deidara’s view, anyhow this turns him cuter. The characters are done in the right proportions, all details are included here, for example Sasori’s puppet body. Just to mention I think you also considered their height (<170cm). An interesting perspective has been chosen, making this picture special, the shadows are drawn well, in a manner which I personally enjoy. The chosen colors all are warm, the lighting is golden, and strengthen the affection displayed here. Me, I really like the effect of this golden light. All together this is a truly wonderful artwork demonstrating love in a beautiful manner. I hope you’ll never quit doing art of them ! What did you use to do this with? It looks like colored pencil/similar to colored pencil. Very good detail in the floor boards. Great job with your lighting, which seems to be very good in all your pictures. Like the poses of these two. I like the way part of the background is dark and then the is this thick piece of light, as if it were a door opened letting in light. And you even have Deidara and Sasori in the light!! So, this is one of my favorite Deidara and Sasori pictures. Plus, it looks like they were possibly having an argument because their hands are either balled into fists, or their fingers are partly bent. This is very hot! The coloring is beautiful! deidara and sasori so cute!!!!!!!!! YES! I AGREE! I looove this team. colours are surely amazing! it is one of my favourite arts! like it very much! The perspective is spot on! i agree they are the best. Oh, look, a pair of lovely bishies standing alone in a room.....whatever shall I do with them? Anyways, I just LOVE your work as usual. The perspectives are looking good, and the effect you put in here looks just so well! Great job as always! 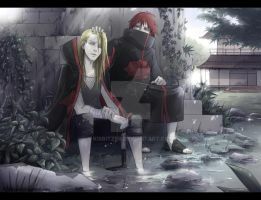 This is kind of exotic Deidara & Sasori picture. I really like it. Its unique. Me encanta! Ahh~ El cuerpo de Sasori es muy fantastico! Por mi, es imposible, pero hacen que parezca fácil. Great colors. I like it very much.